I tend to be inclined to binge things, so if I have all the books in a series or all the shows, I’ll go through them until I’ve finished everything. This was true with the Song of the Lioness quartet by Tamora Pierce. Obviously, this means I recently reread The Woman Who Rides Like a Man (Young Adult Fantasy 284 pages). One of the parts about this book that really struck me is the inclusion of a desert culture in a very positive manner. The desert culture in this book, the Bazhir tribes, are such a different view from the northern people who live in castles and have a hierarchical structure that Alanna’s encounters with them could have gone very poorly. Instead, Alanna does everything she can to abide by their own cultural views and norms. This might be a little easier for her because she doesn’t exactly fit within her own cultural norms, either, and is used to finding ways to belong in an environment not designed or suited for her. She earns a place in the tribe through combat, which is how a man would be accepted into the tribe, and then becomes a shaman to help protect her tribe. She thinks of their codes and their honor and works to uphold their traditions without sacrificing who she is. I also liked some of the more relatable parts of this book, such as on page 53 when Alanna is talking with Ali Mukhtab, the Voice of the tribes, about how she doesn’t behave as they believe a woman should. She gets annoyed and says, “Men don’t think any differently from women – they just make more noise about being able to.” I actually chuckled out loud when I read that, even though I’ve read this book before, I still found that section and the entire dialogue amusing. On page 91, Alanna is trying to provide guidance to other members of her tribe who are struggling to perform an exercise. She tells them, “It’s like anything else in life – becoming a warrior, or a good shaman, or a cook – it will happen if you want it badly enough.” This is something that a lot of people forget a lot of the time. Hard work and effort, working towards your dreams, will eventually pay off but it takes dedication, tenacity, and a little bit of luck, to will your dreams into reality. Things don’t always work out the way we would hope, but with enough time and effort, things really do work out. Alanna had to work for eight years to earn her shield and become a knight of Tortall. She got up early and worked harder than anyone else in her peer group and that’s the only reason she was as successful as she was when she faced the trials of her training, including the Black City and the duel with Roger. She was prepared for those events because she worked hard. Just because she worked hard, though, didn’t guarantee her instant success. Things could have still gone horribly wrong. She never gave up on her dream of becoming a knight and going adventuring and that’s the important part about this. I keep feeling as though there are echoes of similar story lines in other things I reread constantly, most specifically Mercedes Lackey’s Arrows of the Queen trilogy and it got me thinking about writer styles. Mercedes Lackey made a lot of trilogies in her Valdemar books, which many of the early books came out around the same time as these books by Tamora Pierce. Also, interestingly, Tamora Pierce writes a lot of quartets. So Mercedes Lackey writes trilogies and Tamora Pierce writes quartets. The main villain in both sets is a noble sorcerer/wizard and the main protagonist is a young woman who attends training to be a servant of the kingdom. The parallels are very interesting and I would think that people who appreciate one will appreciate the other. Overall, this book is a solid three on my rating scale. I like the cultural background and the continuation of Alanna’s story. I am happy I own this book and will happily reread it again in the future. Pierce, Tamora. The Woman Who Rides Like a Man. New York: Simon Pulse, 2005. 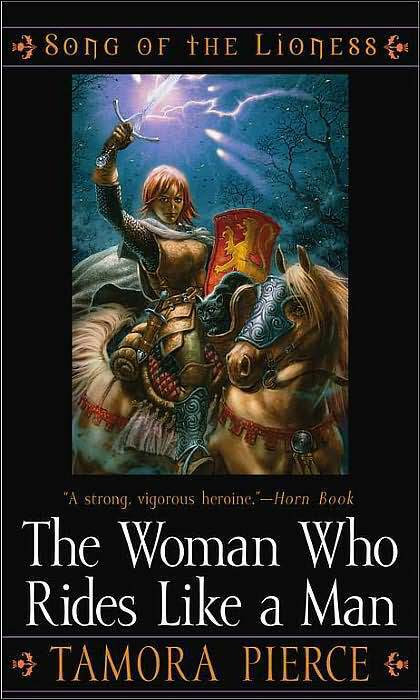 This entry was posted in Book Reviews and tagged Book Review, Song of the Lioness, Tamora Pierce, The Woman Who Rides Like a Man. Bookmark the permalink.